Can A Glass Of Red Wine Replace An Hour Of Exercise? If a glass of red wine equals a hard session at the gym, I’m sure I wouldn’t be the only one swapping in my barbell for the bar. But a recent study from Oregon State University, published in the Journal of Nutritional Biochemistry, suggests you should be logging your glasses instead of your reps. The research suggests that consuming dark-coloured grapes, either by the bowlful, or in a tumblr of wine (our preferred method), can help manage obesity and metabolic disorders, like a fatty liver. The researchers studied how liver cells responded ellagic acid, among other chemicals from Muscadine grapes, in a lab test. The results showed boosted metabolism of fatty acids in the liver. Although Neil Shay, a biochemist and molecular biologist in OSU’s College of Agricultural, admitted that this doesn’t give concrete proof that vino can control body weight, but it does suggests it could help. “We didn’t find, and we didn’t expect to, that these compounds would improve body weight,” he said in a press release. His previous research, although it was animal-based, does suggest similar metabolic effects of other red grapes. Also, the experts suggest moderation when consuming any alcohol. So, that bottle of wine isn’t a ticket to weight loss. A three-to-four-ounce glass of wine a day, might just be. But what do other researchers have to say about wine and body weight? Here are three other studies on just the topic of red wine and health. 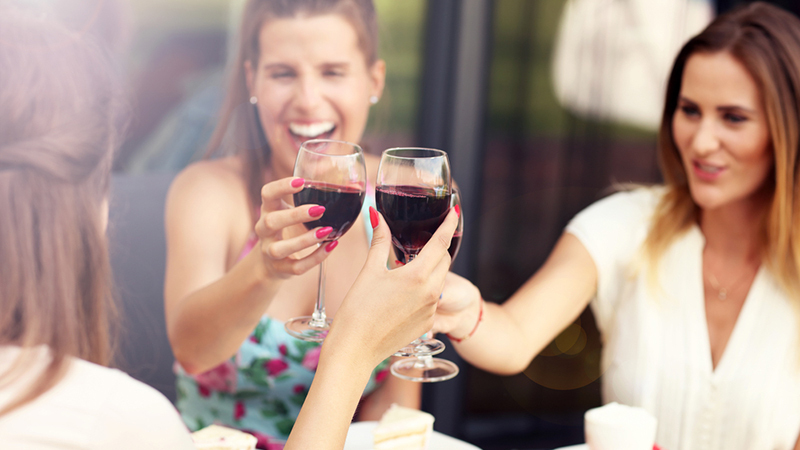 According to a seven-year study of middle-aged, healthy women from various backgrounds, wine can help protect ladies’ hearts. Moderate drinkers (there’s that word, “moderation,” again!) of wine had lower risk factors for cardiovascular disease because of its anti-inflammatory properties, which may prevent clotting in the cardiovascular system. The study was published in the journal, Nutrition and Aging. While some studies attempt to show the benefits of wine, a study from Italy shows a link between it and bodyweight and obesity. This population-based study had subjects answer a diet questionnaire, give blood samples and undergo liver ultrasounds. While being overweight and obese was higher among males, married people and low socio-economic subjects, it was also linked to consuming more than 10 grams of wine daily. It’s not just wine — or any type of alcohol for that matter — that will keep you trim and healthy, says research published in the journal, Current Obesity Reports. Moderate drinking must be coupled with a healthy lifestyle that includes eating well and exercise. Why? Because alcohol has excess sugar and calories, which can cause weight gain if it’s they’re not burned with activities or offset with a low-calorie diet. The researchers reviewed recent studies to determine the effects of alcohol on bodyweight, along with other factors, such drinking habits, physical activity, sleeping, mood disorders, illness, medication, eating, weight gain and more. “Overall, obesity is a multi-factorial condition and it’s difficult to truly assess the independent influence of alcohol intake on obesity risk,” conclude the researchers. You probably already knew this, but it’s as true as ever. Use common sense when it comes to your health. The magic bullet for health isn’t necessarily skipping the gym to have a glass of wine instead (though that’s perfectly okay every now and again!). It may be beneficial to have a glass red wine a day, but only if you also stay active and eat a balanced diet.